Nidhila Adusumalli is a Research Associate at J-PAL South Asia. She works on the Mission Kakatiya Evaluation Project in Hyderabad, which seeks to study the impact of rehabilitation of minor irrigation tanks on agricultural outcomes across the state of Telangana. Prior to joining J-PAL in 2018, she worked with the IGC on a project studying coordination and leadership in the context of different religious beliefs through a series of lab-in-field experiments in Uttar Pradesh, India. She previously interned with the Government of Kerala's State Planning Board and the Government of Assam's Directorate of Economics and Statistics. 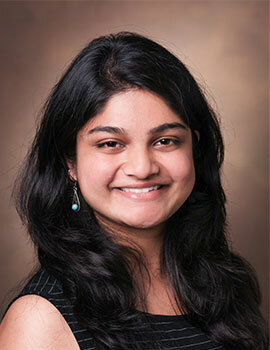 Nidhila holds an MA in economics from Vanderbilt University in the United States and an MA in applied economics from Jawaharlal Nehru University (JNU) in India. Her research interests lie in the fields of economics of gender, global health, and education.